Gusto has been our preferred payroll platform since it started. Up until now, we’ve needed to add an additional application for customer’s that need time tracking. That’s hasn’t always led to an optimal experience. We’re all about “less is more” so we love it when an application adds functionality that reduces the app stack. 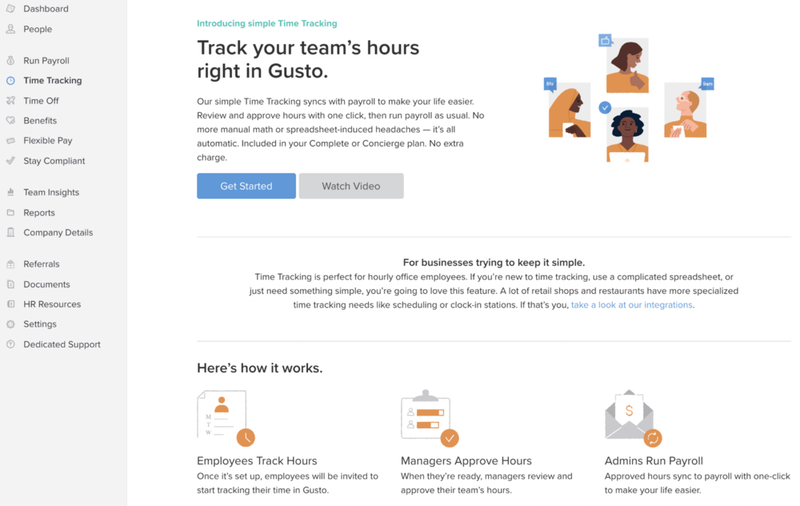 We were surprised to see “Time Tracking” in our Gusto account a few days back and are glad it’s an official release. What a pleasant surprise! Here’s what you’ll see in your Gusto account. The functionality is pretty basic and only works for hourly employees right now. There is no project tracking either which would be amazing. We just have to wait and see how this evolves but we’re hopeful considering how fast Gusto seems to iterate. So if you have basic time tracking needs right now, give it a go! And, if you need a little help getting started with set up or configuration, reach out. Our team understands small business bookkeeping and payroll needs and can get you up-to-speed in little to no time. Who should I Hire: Independent Contractor or an Employee?